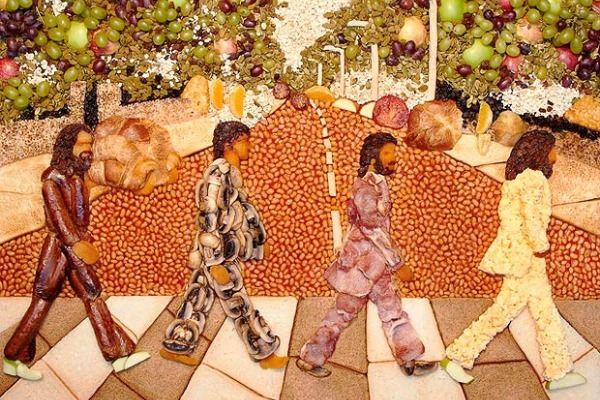 The #1 Albums: "Abbey Road"
To honor the 50th anniversary of the Beatles’ first sessions at Abbey Road Studios, food sculptor Paul Baker recreated the “Abbey Road” cover using elements from a classic English breakfast. Note that vegetarian Paul is rendered entirely in mushrooms. Certain albums in this series present a particular challenge, as we’ve noted before: What can one say that’s fresh about some of the most famous albums ever recorded? For that, we turn once more to Wikipedia for five random facts about Abbey Road by the Beatles. —Most of the album was recorded in July 1969, although bits of it go back to February and the last of it was completed in mid-August. Despite the ongoing dissolution of the band, the Beatles were working on a lot of stuff during this period, much of which would be saved for Let It Be in 1970. —While Paul McCartney was lavishing great care on “Maxwell’s Silver Hammer,” take after take after take, the other Beatles were fuming. George Harrison eventually told him, “You’ve taken three days, it’s only a song.” John Lennon was present in the studio but doesn’t appear on the track. —A direct quote: “Abbey Road was also the first and only Beatles album to be entirely recorded through a solid state transistor mixing desk as opposed to thermionic valve.” The hell you say. Abbey Road is by no means a perfect album. (Two tracks were mentioned in our World’s Worst Songs series.) But any record that contains “Here Comes the Sun” and the medley of songs that closes side two is going to outrank almost everything anybody else might attempt to do. Abbey Road hit #1 on the Billboard 200 on November 1, 1969, and spent 11 weeks at #1 in three separate runs at the top. Toward the end of that run, it would swap off at #1 with the heaviest, hardest rock album to hit #1 up to that time. That’s our next installment.